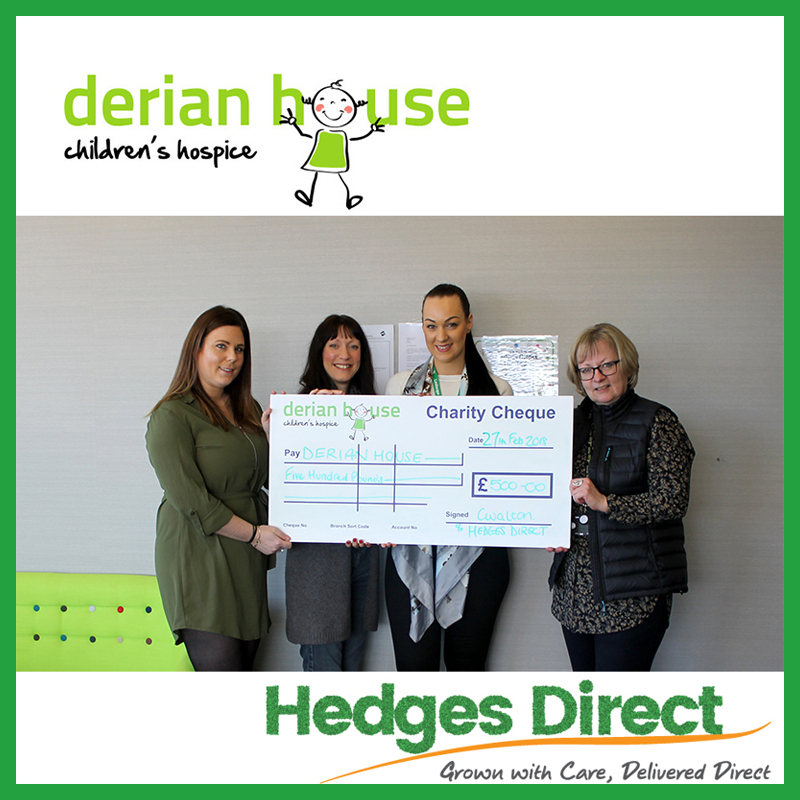 Hedges Direct are proud to have donated money towards Derian House who is renowned throughout the region as being at the forefront of children’s palliative and respite care. They used this money to take the children on a fantastic day out to Chill Factore. What a fantastic idea for the children and we are proud to have been able to give them this opportunity. Pictured below is Hedges Direct staff presenting the cheque to Elaine Middleton, Corporate & Sponsorhip Fundraiser. “At Derian House we feel privileged to be counted as the friends of the many families we have cared for and supported since the hospice opened, as well as those to whom we continue to offer ongoing support. We know there will be countless others in the future who will need us to be there for them, to provide not only a high standard of specialist care for their child, but a reassuring framework of emotional support for them as a family. Our ethos is to ensure that quality of life is enhanced for children and young people with life threatening conditions. Each child’s condition is different and how each family copes is different. In supporting any child and the family everything is centred around their wishes, which are fully respected at all times. Far from being a place of sorrow, Derian House is a place of love, laughter and respect. Everyone visiting remarks on the happy, welcoming atmosphere, and even at the worst time in their lives, parents speak of their gratitude for the safe haven that is Derian House. In looking back over the past twenty three years, and all that has been achieved, we also look forward to the future and the fresh challenges it will bring. Whatever those challenges may be, we will continue to do our utmost in striving to meet the highest standards of care, and the needs of the many families who depend on Derian House for the care and support it provides for them and their children. Drawing on experience gained over the past twenty three years, the hospice team has refined and developed a range of care techniques and support strategies in such a way as to maximise potential, and ensure best practice across all disciplines within the hospice. March Gardening AdviceJoin our Easter egg hunt!